So you’ve got a test coming up and you’ve decided to go with a Flush drink, there’s just one small snag to your perfect plan, the flush you’ve chosen will only keep you clean for 3-5 hours, and you need a bit more time than that. Well now you don’t have to worry about that any more. Vales +2 is the solution to your problem. 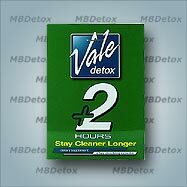 A Revolutionary new product designed to extend that window of time by 2 hours so you no longer have to worry about getting there exactly on time, or sitting in the waiting room too long, now you can extend that cleanse as long as you need to.